1. Marinate fish in fresh rosemary, white wine and olive oil for about 20 minutes, in the last 5 minutes add juice from 1/2 lemon. 2. 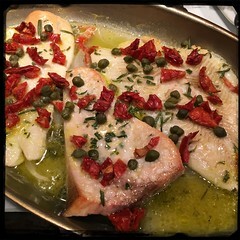 Place fish in a shallow pan and top with a bit of salt, pepper, rosemary, hot-pepper flakes (optional), capers and sun-dried tomatoes. 3. Preheat oven or BBQ to 250F. Once heated place pan in oven (BBQ). Cook for about 30 minutes or so.